As he backed the 22-foot boat down the driveway, Joe Slocum announced, “First, we have to go for bait.” For most anglers, this means a quick stop at a bait shop to fill up the minnow bucket. But not for Slocum. We instead headed for a wide channel of the Tennessee River southeast of Knoxville, where we used a dirt ramp to launch the boat at a junction of slow-flowing tributary fingers. The water seemed almost caramelized with the remains of lily pads and dying weeds, the shoreline a maze of nooks and crannies. After launching, Slocum eased the boat to the downstream side of a crumbling bridge and readied his big net for a cast towards shore. On past trips, we had taken our bait from other sites. But in the cooling November water, baitfish were massed on the edges of the brown grass where they could peck at aquatic insects feasting on decaying weeds. The net arced up and out then came down on the surface with a heavy splash. As it started to sink, Slocum pulled the cord and tightened the bag. As the veteran angler emptied the first netting of shad and sunfish into a waiting 5-galloin bucket, we both smiled. All told, we spent about 30 minutes gathering a dozen nice bluegills and a few more shad. It took another hour to get the boat back on the trailer and then drive to our true destination on the Tennessee River. But, eventually, we were anchored in the right place, with a row of cast rods stretched from bow to stern. Each line ended in an 8/0 hook, with one of the lively baitfish impaled on said hook. Catfish are usually thought of as creatures of slow or still water, and many a big cat has been taken from a backwater sluice. But catfish, and in particular blue catfish, also hunt in moving water where the scent molecules of live and dead creatures alike are carried along by the current. Blues swim against this current, picking up the scents as they go. Slocum had anchored the boat in an advantageous position along a secondary channel, in slack water but directly adjacent to current. About 30 yards below us an outward curve in the shore had collected a dense pile of logs, enough to make millions of matchsticks. The main Tennessee River channel was a good quarter-mile away, but there was still a slight flow at the side of the boat. Indeed, we were able to cast the bow rods into the flow, and when each bait settled, it hung on the very edge between moderately moving and slower water. In case the flatheads bit better than the blues that night, the rods closer to the stern had been cast back into slack-water. Veteran anglers know a big blue cat is likely to bump or mouth a bait for some time and may even carry it a while before swallowing. This may be the cat attempting to keep the bait away from catfish competition, or maybe just an attempt to place the bit in a more advantageous position for swallowing. Whatever the case, it seems to happen most in slow water, and spotting a bait on the edge of current helps cats locate it and also gives them a quick route to this slower water. Wise anglers also know that the rod should not be picked up nor the reel tightened during the brief bursts of initial line movement. Setting the hook at the first tap-tap-tap usually results in missed opportunity. After arranging each cast rod in the correct position around the boat hull, Slocum put the reel clickers “on” and set the drags precisely right so the 30-pound-test line could run freely off the spools without any overwind backlash. Slocum explained that a cat must be allowed to run a little line but not go so far that an unwieldy amount of line gets out in the water. Conversely, locking down the drag too tightly can cause a cat to feel unnatural line resistance and likely drop the bait before it swallows. “You learn these things about blues,” Slocum observed. 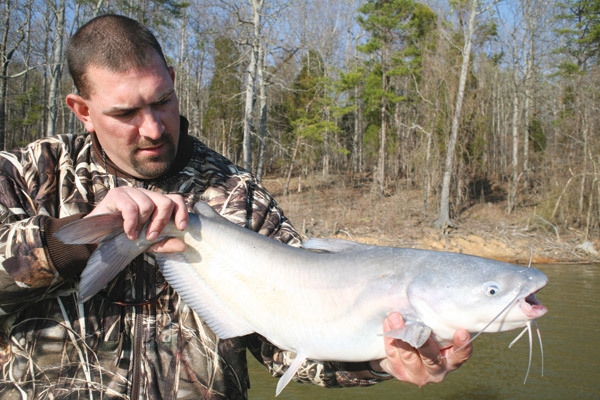 Slocum also likes to fish for blue cats near the main channel of the river, in what amounts to the main body of Watts Bar. But to fish that area well requires more time than we had that night, and also a bit of luck, because the blues may be found anywhere along the channel. Catfish are sensitive to light, and throughout summer they feed most actively in late evening or during the night. But the colder autumn water changes this feeding habit, at least to some degree. With a water temperature in the low 60s, they’re more inclined to hit earlier rather than later, and when the water dips into the mid-50s, they may feed more during the day than at night. This evening, we connected with two channel catfish before we got the first bump from a blue. The channel cats hit on the edge of current—a preference they share with blue cats—and Slocum said he was satisfied the lines were in the right position for blues, too. Slocum’s standard terminal rig consists of an 18-inch section of 50-pound shock leader connected to the main line by a heavy barrel swivel. A slip weight goes on the main line above, with a bead between the weight and swivel, to help cushion the line knot. Ninety-pound-test swivels have become standard equipment for today’s serious big-cat anglers, and one may only guess how many lesser swivels were sprung before the fishermen settled on something that stout. Weights vary with water conditions and angler preference, but typically fall between 2 and 4 ounces. Some like a flat sinker, especially where current or bottom contour may allow a weight to roll along without “setting.” But, in the secondary channels where current is less of a concern, Slocum prefers an egg sinker. Each kind grabs the bottom differently, but both have a big enough hole that line can pass freely through. Slocum said blue cats zero in on the vibration of a lively baitfish, and it’s not only OK but actually better if the line is left slack enough to allow a little movement. One of the baits that had made us smile earlier that day, a chubby 4-inch bluegill, got nervous just as the sun began to set. Before putting this ’gill on the hook, Slocum had cut it just under the tail to increase the scent trail. The six-foot rod and the arc of line dipping from the tip snapped a few times like a dog pulling on its chain. Then things got quiet for a while—before we heard the pleasant tune of the clicker taking a few turns followed by a short but smooth racheting run. Slocum allowed me the honors, so I gingerly picked up the rod and waited. I felt occasional soft jabs but nothing that told me the cat had truly swallowed the bait. Just as I was getting concerned, the line strung out and I experienced the full weight of the fish swimming off. Setting the hook woke the fish from its post-meal revelry, and the fight was on. I knew right away it wasn’t a giant catfish, certainly not a fish to impress the boys at the boat ramp. But it did put a stiff bend in the rod, and coaxing the fish to the boat took a few minutes of not-so-gentle persuasion. Mainly, the cat wanted the current, and seeing this prompted Slocum to surmise that it was a blue. He was right. When I brought the fish to the net, its pale blue flanks rinsed silver in the dimming light. Compared to the muddy mottling of a flathead or even the pewter grey of a channel cat, blues have a sheen that makes them more attractive than other whiskered fish, at least in my eyes. This fine fish weighed maybe 12 pounds. On similar autumn evenings, Slocum and I had landed a half-dozen or more that topped 20 pounds. Unfortunately, I had to hit the road that night, and the following evening, Slocum called to report landing two blues that easily topped 20 pounds. Later that month, when the water dipped into the mid-50s, he caught fish up to 35 pounds in the middle of the day.